A large construction company had a project in West Seattle building a new apartment and retail complex. There was a need to install new floor outlets throughout the building, which meant concrete sawing and coring was needed. 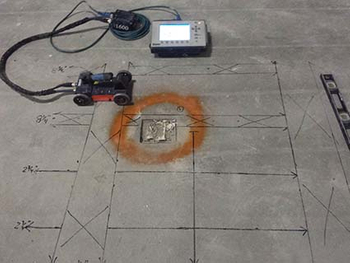 Prior to beginning the sawing and drilling processes, the contractor contacted Ground Penetrating Radar Systems of Washington (Portland) to scan the floors to locate the reinforcing steel and any conduit present. GPRS used a 1600 MHz antenna for the project that allowed for precise locating of the reinforcement/conduit. GPRS marked the reinforcing steel pattern and conduit locations directly on the floor using black permanent marker so the cutting and coring areas were clear prior to continuing the project. The general contractor had all the information needed to proceed with confidence, to drill and saw through the floor and install the new electrical outlets. To learn more about the capabilities of GPRS Washington, contact Project Manager Eric Steyer at (503) 502-4781 or eric.steyer@gprsinc.com.